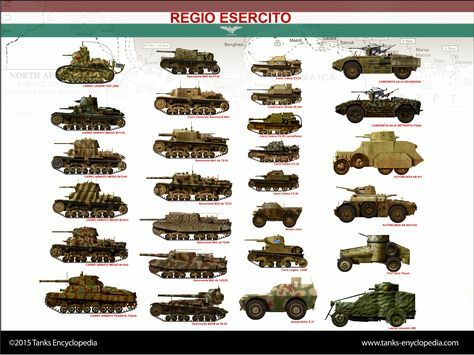 Among the last Italian tanks to enter service were tank hunter derivatives of the Italian M42 medium tank. The standard was the Semovente da 75/34, but there was already a very potent gun in service with the Italian Army that could be adopted instead, the anti-aircraft 75/46 Modello 34. But, due to its weight, the engineer Giuseppe Rosini of Ansaldo planned to use the M42L chassis for the controcarri adaptation instead. When the Armistice of Cassibile of September, 3, 1943 was signed however, these plans were halted, as factories in the vicinity of the German occupation zones fell under their control. Therefore, with the personal and materials left, these factories, now under full German control, were ordered to produce the new tank hunter marrying the M15/42 chassis with the modello 34 L/46 anti-aircraft gun, already in short supply. Although still based on the M15/42, the new Semovente received the Cannone da 75/46 C.A. modello 34. Such guns were already captured and used by German forces, as the 7.5-cm Flak 264/3(i). This potent piece of ordinance was 3.45 m (10 ft) long, with a HE shell weight of 6.5 kg (14 lb 5 oz) (HE), 75 mm (2.95 in) caliber and 46 caliber long. It had 34° of traverse and -12 ° to + 22 ° of depression/elevation inside the casemate, and a muzzle velocity of 750 m/s (2,500 ft/s). The chassis differed little in general appearance from the previous Semovente M42, but the M42L was lower and wider. This version, exclusively developed for German use, had a roomier casemate with a more sloped front, and a general increase in armor thickness, from 75 mm to 100 mm (2.95-3.94 in) on the front, 42 mm to 60 mm (1.65-2.36 in) on the sides and 25 mm to 35 mm (0.98-1.38 in) on the rear plate. The drivetrain was unchanged, composed of two bogies with eight double roadwheels suspended by VVS. The Semovente da 75/46 was propelled by the FIAT V8 SPA 15TB M-15 diesel (360L) 192 hp engine, but top speed was only around 38 km/h (24 mph). Aside from the main gun, there was a provisional mount on one of the roof hatches for a Breda 8 mm (0.31 in) light machine gun, which could also be used for AA defense. The latter could be served by the commander/gunner, while the loader/radio operator had a radio Magneti Marelli RF1 CA at his disposal at the rear. Eventually only 11 to 15 vehicles were built, named M42T (for “Tedesco” – German), during the fall of 1943 (8) and early 1944 (3), and called StuG M43 mit 75/46 852 (i) in German service. It was used by a single JagdPz. Abt. throughout 1944 and 1945. 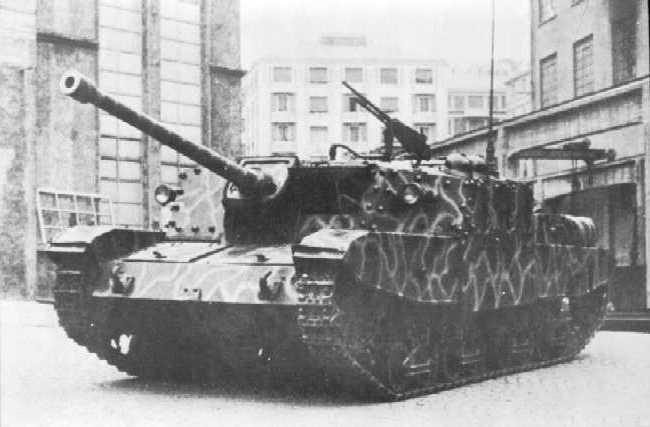 The even heavier Ansaldo 105/25 M43 was developed at the same time. Sturmgeschütz M43 mit 75/46 852(i), Gothic line, fall 1944. 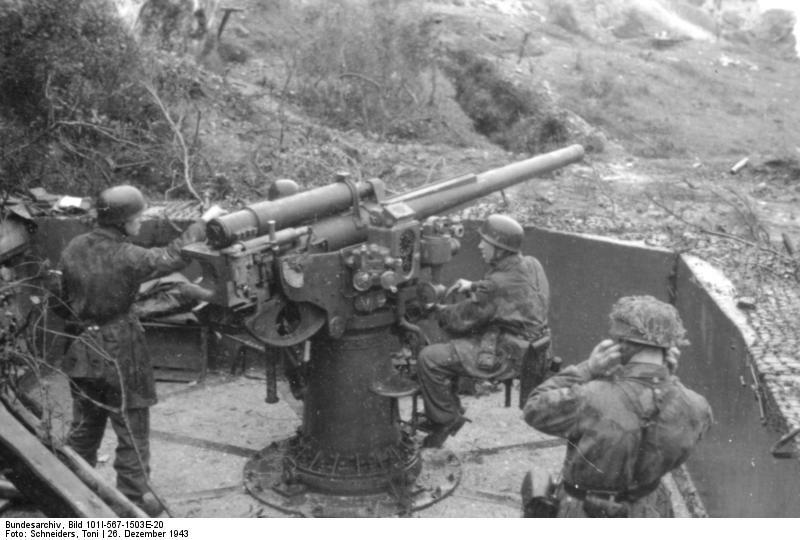 Bundesarchiv photo of the Cannon da 75/46 Modello 34, used as an antitank gun in Italy by German troops. This tank were all captured by the German troops who use that tanks with the “Prinz Eugen”division. For that reason the tank don’t had the Breda 38 by 8 mm but the German medium machine gun MG 42 with 1500 rounds.